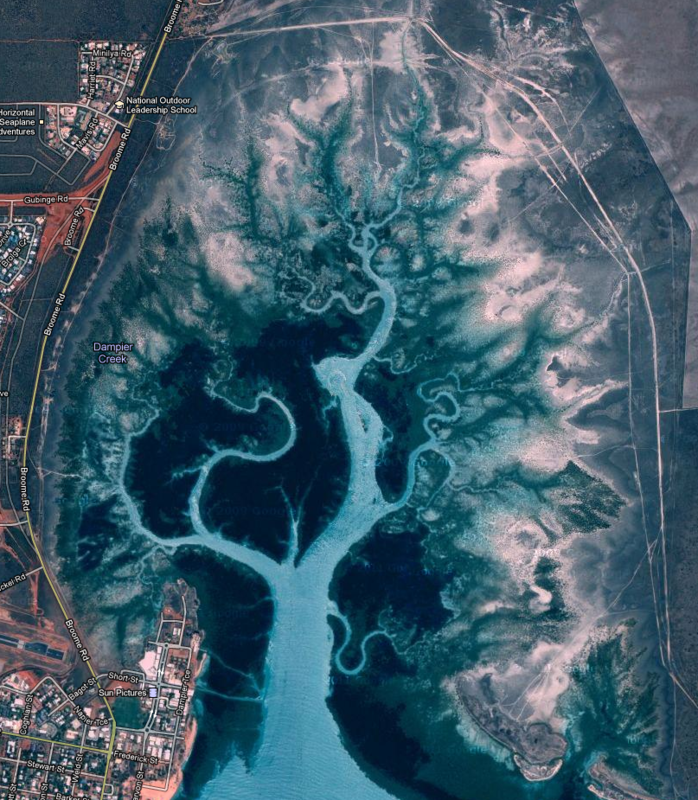 Tree of Life Found in Broome Australia. - John Dalton - gently does it . . .
All You Need Is A Satellite To See It. I was noodling about on google maps a couple of weeks ago looking for the regional office of a car hire firm in Australia. What? You don’t look for car hire firms in random locations? My wife runs a migration business and she asked me to locate these offices as the company were hiring and she wanted a map embedded on her website to help possible migrants see just where the hell they might be migrating to. I found the office in Broome and was about to move on to the next location when, out of boredom more than anything else, I switched the map to ‘satellite’ view. I don’t like to use the phrase, ‘I couldn’t believe my eyes,’ but I genuinely had a couple of moments where I couldn’t make sense of what I was seeing. If you’ve spent any time on google maps you’ll know that it’s generally not that appealing to look at, it’s either checkerboard cities or wide open spaces of not much, so when the image of this azure tree framed in verdant relief appeared beside the town of Broome it just didn’t fit. I zoomed in and out a few times just to be sure it wasn’t some glitch with the map but there it remained; this magnificent image. In my book Maya Noise I talk about the mystery of natural beauty and how I see it all over the place. Well here was another example, on google maps of all places. Here it is for you to see for yourself.